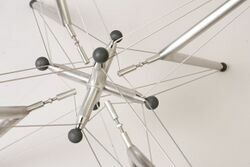 Read here about an artist and designer who implements tensegrity concepts in his work. 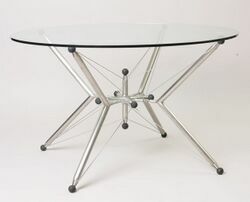 Konstantin Achkov uses tensegrity modules in his tensile structured furniture designs. Born in Sofia 1973, he earned a Ph.D. from the Institution: National Academy of Fine Arts, Sofia. He has executed many works in Sofia including interior design of the restaurant "Luciano" and the cafe bar "Football". My interest in the Tensegrity sculpture and my experience, have naturally led to my future development in the direction of the same style. 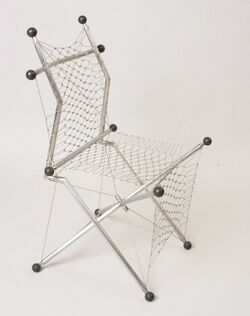 Further improving my know-how as a PhD student, I was looking for applying the Tensegrity style in the furniture design. In my opinion, this is a new basis of the form-creation, demanded by the logics of the minimalism and the natural approach not only to the sculpture but also to the architecture. 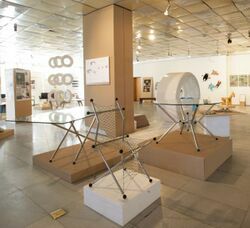 Moreover, the Tensegrity constructions give flexible behavior of the furniture and encourage its self-adjustment to the terrain or to the body. 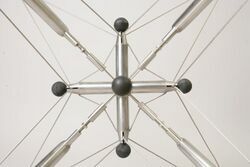 The Tensegrity furniture brings the sensation of flying in some elements, carried by tense ropes. This specific kind of tectonics touches the feeling of anti-gravitation and beautiful geometry. They require intelligent decisions that attracted me to follow the challenge to find my solutions in the construction of this type of furniture. 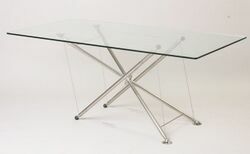 X-Tense Table and Chair with V-Star Table on display in Bulgaria, by Achkov. 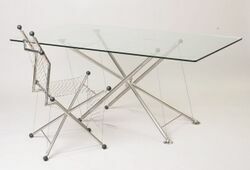 X-Tense Table and Chair by Achkov. 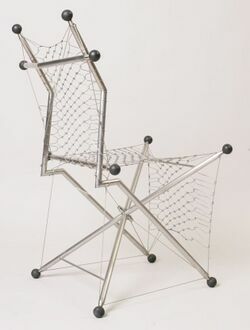 X-Tense Chair detail, by Achkov. 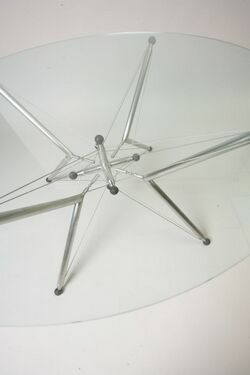 V-Star Table detail by Achkov. This page was last edited on 2 October 2018, at 07:41.